As soon as I met Sarah and Andrew, I knew this was going to be a special wedding. First of all, they are two of the kindest, most genuine people I have ever met. They have already faced significant challenges early in their relationship and supported each other unconditionally throughout. 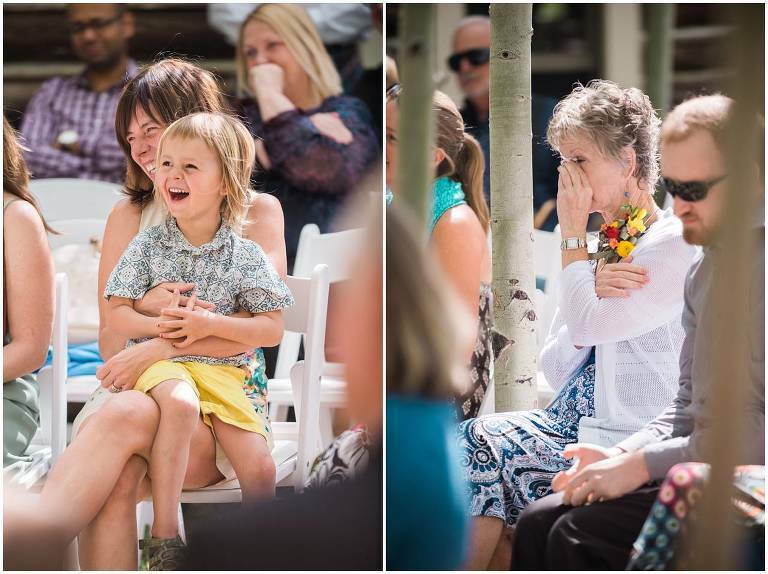 And, while many brides may plan a Snowy Range Lodge wedding in Wyoming, only ONE bride can say she grew up there! That’s right: this also happens to be Sarah’s childhood home. I can only imagine how fun it was to grow up here! Sarah and Andrew’s ceremony was very unique. They opted for a “silent” ceremony, which is exactly what it sounds like. 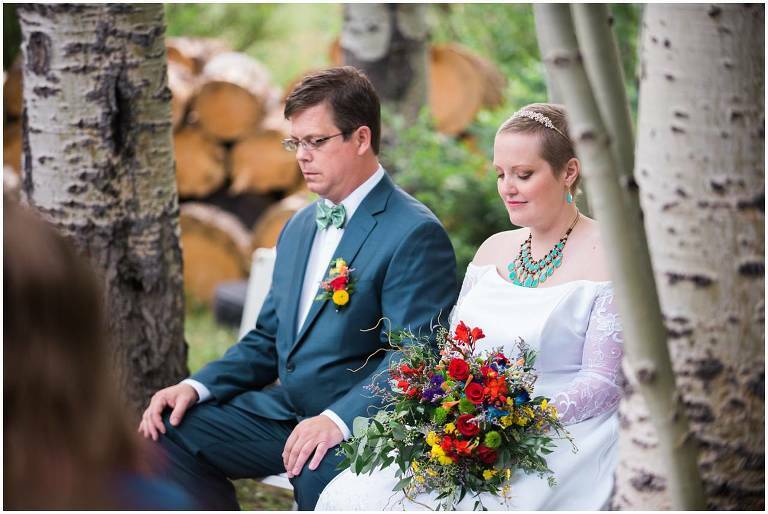 They walked into the Aspen grove in silence and sat with each other, surrounded by their loved ones, and invited everyone to sit in thoughtful reflection. Between moments of meditation, they did invite a few people up to read poems or stories they thought would be fitting. Everyone laughed! Everyone cried! It was quite a rollercoaster. We had a few moments before dinner to walk around the grounds Sarah had spent so many hours exploring. I always love listening to the toasts of family and lifelong friends. I feel like that’s when I REALLY get to know the couples I’ve been photographing. Luckily, Sarah and Andrew’s guests were very kind. There were very few embarassing revelations, but it seemed unanimous that everyone had been certain they’d get married for quite some time. When we initially met, the VERY first thing they told me about their wedding was their first dance. They excitedly informed me that their very romantic first dance as husband and wife would be… “What Does the Fox Say?”. Complete with fox masks. I loved it! It was definitely very “them”. Thank you, Sarah and Andrew, for inviting me into your home and sharing this day with me. I wish you much love and good health for years to come! 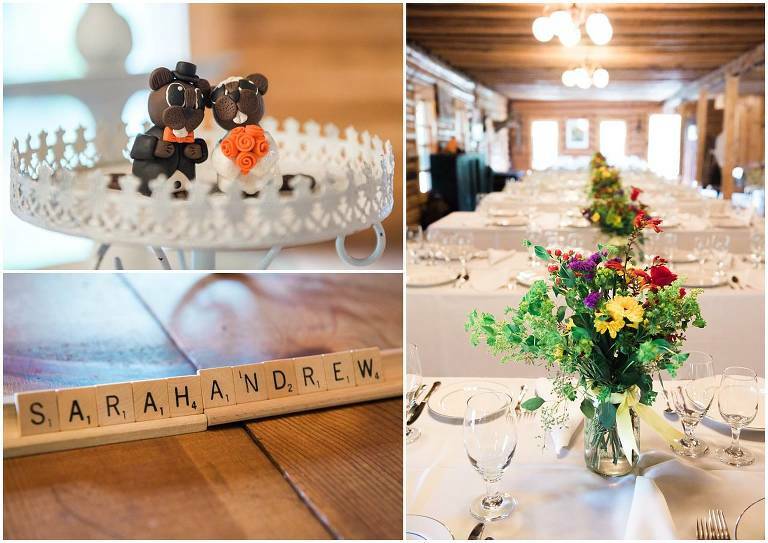 Planning your own Wyoming or Snowy Range Lodge wedding? Let’s get in touch!